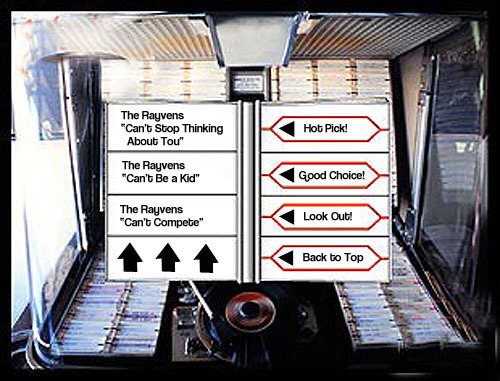 The Rayvens on the jukebox..
... Dr-r-r-rop the coin- right into the slot! Your counter top, diner juke box... one of the best places to dig some solid Rayvens tunes with a cup of Joe and homefries.... chocolate sunday with plenty of jimmies... - just click on the song titles and Real Player spins the records. If... you need a Real Player.. just go HERE for a free one.